Writings that touch the pure-flaming heart of God ... from the men and women who walked with Him through the ages...guiding into a deeper friendship with the "Father of Lights. "Today, when there is so much interest in the invisible world of angels and demons, how can we know whether the speculation about angelic interventions, swordplay in the heavenlies, and signs in the sky is true? What role do angels actually play in our lives?Bernard of Clairvaux (1090-1153) stands among the rare handful of men and women gifted with true insight into the unseen, supernatural world. Known throughout the medieval church as a "spiritual doctor," he was given both a spectacular vision of angels and the wisdom to understand their purposes among men. May his words fix in your soul a vision of the beauty of God himself, and may you sense the help of angels, as they guide you to the real presence of the One true Lover of your soul. Bernard of Clairvaux (1090-1153) stands among the rare handful of men and women gifted with true insight into the unseen, supernatural world. Known throughout the medieval church as a "spiritual doctor," he was given both a spectacular vision of angels and the wisdom to understand their purposes among men. 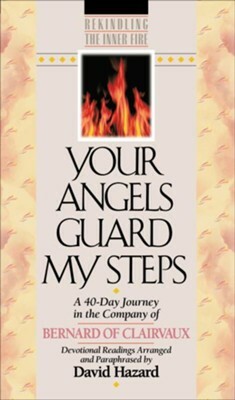 I'm the author/artist and I want to review Your Angels Guard My Steps (Rekindling the Inner Fire Book #10): A 40-Day Journey in the Company of Bernard of Clairvaux - eBook.